Here are what I believe to be seven great Bible studies for your home Bible study groups. We recently had a Bible study at our church that would be a superb Bible study for home. This Bible study concentrates on 1 Corinthians 13 and Romans chapter 12. These chapters are sometimes called “the love chapters” and they show that the main thing we should focus on, next to Christ, is in how we treat one another. Our actions betray our hearts, for good or for bad, and if we treat others and even esteem others better than ourselves, then we are fulfilling the royal law to love our neighbor as ourselves (James 2:8). Of course we don’t have trouble loving ourselves. We nurture, care for, provide for, and yes, even pamper ourselves but do we treat others in this same way? The first and greatest commandment is to love God (Matt 22:37), “And the second is like it: ‘Love your neighbor as yourself'” (Matt 22:39). First John chapter 2 tells us that we can’t say we love God but not our brothers and sisters (1 John 2:9-11). Luke chapter 6 is also a superb example of not only how we treat one another but how we treat even those who are our enemies. Sometimes we can take text out of context to make it a pretext and much of the time, it’s a false one. One real life example was that of a young man who was just released from prison. When he got out, he thought he was going to skirt the law a bit and not tell his parole officer everything. When others would try to correct him or warn him about that being a violation of parole, he would quote (or misquote?) Acts 5:29 where “Peter and the apostles answered, ‘We must obey God rather than men. '” Yes, I agree, and especially when God’s higher, moral law supersedes man’s laws, but this is not what was going on in Acts chapter 5. They had really broken no law and weren’t on parole for it. Romans chapter 13 is where this young man should have done a home Bible study because it expressly states that “every person be subject to the governing authorities. For there is no authority except from God, and those that exist have been instituted by God” (Rom 13:1) and “whoever resists the authorities resists what God has appointed, and those who resist will incur judgment” (Rom 13:2). Those who are in authority are “God’s servant for your good. But if you do wrong, be afraid, for he does not bear the sword in vain. For he is the servant of God, an avenger who carries out God’s wrath on the wrongdoer” (Rom 13:4). This is a good one to have children present so that they see law enforcement agencies as agents of God. Sanctification is not an overnight thing. It takes a lifetime of growing in the grace and knowledge of God’s. You only have to look in Romans chapter 7 to see that Paul struggled with his flesh and since he did, we will also struggle to not do the wrong thing, even though that’s frequently what we do. Then we also know what good thing to do but then choose not to do it. This home Bible study could give hope for those who are struggling with besetting sins. James writes, “confess your sins to one another and pray for one another, that you may be healed. The prayer of a righteous person has great power as it is working” (James 5:16). This brings up a great idea of having an accountability partner to see how their walk with Christ is going. Set certain days of the week when one person knows they must call their accountability partner and tell them how well or not so well they did this past week or days. We are all accountable to one another. Besides, this draws us closer together. The word fellowship is a great home Bible study topic because in the Greek (“koinōnia”) it means “an association, community,” or “communion” which means “with union.” There is probably a better chance for more intimate fellowship in a home Bible study because everyone likely knows everyone there and they might be closer to them than others in the church, otherwise they might not be meeting together in the first place. Fellowship is the horizontal relationship we have with one another and it is loving our neighbor as ourselves, but it’s much more than that. It’s being of one mind, one spirit, and one purpose and that is to glorify God and seek those who are lost. It’s more easily done in a community or fellowship of believers than in going it alone. Many of the missionaries that are asking for prayer are not usually asking for the persecution to end. They see it the way God sees it and it often helps spread the gospel. One example was when “there arose on that day a great persecution against the church in Jerusalem, and they were all scattered throughout the regions of Judea and Samaria, except the apostles” (Acts 8:1) and as a result of that, “those who were scattered went about preaching the word” (Acts 8:4). Sometimes the Devil helps spread the gospel by inciting others to persecute Jesus’ witnesses It seems the more persecution there is, the further the gospel spreads. God wants to use us as a means to save others by telling others about the necessity for Christ. Persecution comes with great blessings (Matt 5:11; Luke 6:22). The Apostle Peter writes that “If you are insulted for the name of Christ, you are blessed, because the Spirit of glory and of God rests upon you” (1 Pet 4:14). If the creation could talk, and in a sense it does, it would say, as the psalmist writes, “The heavens declare the glory of God, and the sky above proclaims his handiwork” (Psalm 19:1) and even “Day to day pours out speech” (Psalm 19:2a) so the creation is glorifying God. Since we are part of His creation, we too should strive to glorify God. Again, the psalmist writes, “You who fear the Lord, praise him! All you offspring of Jacob, glorify him, and stand in awe of him, all you offspring of Israel” (Psalm 22:23) but this isn’t just a command for Israel but it is for “everyone who is called by my name, whom I created for my glory, whom I formed and made” (Isaiah 43:7). 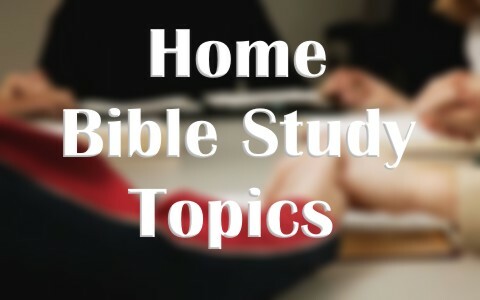 If this home Bible study glorifies God, then it has been successful. There is something about a home Bible study group that can draw the participants closer together and as the proverb says, “Iron sharpens iron, and one man sharpens another” (Prov 27:17) and that’s good, because, as you probably know, rust never sleeps. There are at least two great benefits to a home Bible study group: We can grow in the grace and knowledge of God (2 Pet 3:18), but we can also grow closer together, whether that’s in a Bible study or Sunday school class at church, or at a home Bible study. I need 7 great topic for home bible stadi books help me.pastor Rathna kumar. Hello Rathna. If you read the article, there are already 7 great topics the author has listed. Please use these topics but the greatest study book there is the Holy Bible. Make the Bible your main source of study and no book from man. Hello Eric. Thank you so much sir. You are so right. We did correct it. Previous post: What is the Shekinah Glory of God described in the Bible? Next post: What Happened To Joseph, The Father Of Jesus, In The Bible?